The price tag might seem steep, but with a features list that includes DVD playback and recording, a 160GB hard disk, 5.1 surround sound and video upscaling, this rig could even be a bargain when you consider how much it is possible to end up paying for separates. 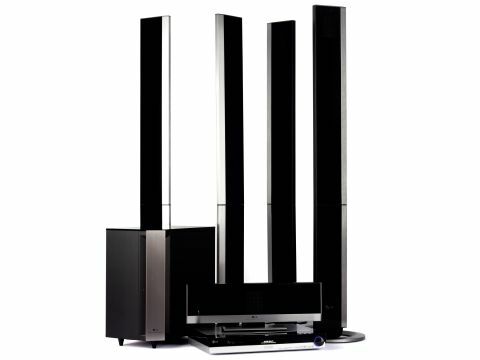 The main unit's black and silver styling lends it an attractive, cutting-edge feel, while the matching NXT flatpanel speakers are very suave, if a little imposing. The 160GB hard disk stores up to 233 hours of programmes for DVD recording and you're not locked into a couple of formats - it can use any disc except DVD-R (DL). You also get an FM/AM radio tuner, but the built-in TV decoder is of the analogue variety only. Also disappointing is the absence of DVD-Audio playback (which is found on some other systems in the range), but LG has seen sense on the video side and included 720p/1080i upscaling for hi-def TVs, delivered via the HDMI output. Joining this are two Scart sockets (an input and an output, both RGB-capable) and a component video output capable of progressive scan. There's also an optical digital input, which means you can pipe Dolby Digital 5.1 soundtracks from a Sky box without the need for an adapter. On the front panel is a DV input for camcorder enthusiasts and a USB port that enables you to play back MP3, WMA and JPEG files (but not DiVX). You can also copy these from disc or USB device to the hard drive to create a multimedia jukebox. There are four recording quality presets. These are XP (1hr on a single layer DVD), SP (2hr), LP (4hr) and EP (6hr). These times are roughly doubled for DVD R DL discs. Also, you can make recordings in MPEG4 (XviD codec) and transfer them to a portable video device. Hard-disk editing functions are surprisingly limited. You can't piece recordings together in a playlist, you can only delete parts of a recording, or combine or divide titles or chapters. Playlist editing is only for DVD-RW (VR) and DVD-RAM discs. Elsewhere, there's a buffer memory (timeshift) mode that enables you to pause live TV, while Clip Record means you can go back to find a buffer segment to save onto the HDD. The system is easy to install and use. The subwoofer handles amplification and the main unit connects to it using a controller cable, while the speaker wires plug into springclip terminals to the rear. The tallboy speakers must be slotted and screwed onto the stands, but they can also be wall-mounted. The remote positively bristles with buttons, including keys for changing the resolution and recording mode. You can't switch directly between HDD and DVD though, so you have to enter the central 'Home' menu where all your media can be found. Editing is the only function that requires any thought as there are loads of options to get your head around and it might not be clear what's going on without the manual. The LH-RH760TF's superb picture quality proves its worth as a digital receiver. Using a Sky HD digibox as our source, we pipe an episode from Lost: Season Three into the RGB Scart input, and in XP mode we get satisfying recordings that closely match the source. Colour reproduction is first class, demonstrated by the purity of the greens in the island's abundant jungle foliage and by the richly saturated blue sky. Detail levels are also impressive - close-ups of Locke's face shortly after the hatch explosion reveal clearly visible stubble and cuts, while leaves, branches and other background details are well rendered by a competent MPEG encoder inside. SP mode looks much the same, apart from a fractional increase in 'twitching' glitches. LP and EP show increased noise levels, but offer tolerable pictures for recordings where perfection isn't important. There are no qualms with prerecorded DVD playback. With the Extended Edition of Gladiator the system offers clean, well-defined images with little or no noise and vivid colour reproduction. Ramping up the resolution to 1080i won't provide much benefit unless you've got a 1,080-line TV, but it certainly doesn't do any harm either. Gladiator looks great in both 1080i and 720p, but there's not a lot of visible difference between them. Overall sonic balance is very good. Okay, the subwoofer's bass output sounds a little hollow and boomy, but once the level is trimmed, these superior satellites aren't taxed. Indeed they work wonders with the film's rousing Dolby Digital soundtrack, reproducing the clanking swords, thundering chariots and roaring tigers crisply and clearly without one word of dialogue getting lost in the melée. There can be few complaints with its very pleasing CD playback either. The lack of a digital TV tuner and DVD-Audio playback mean that the LH-RH760TF doesn't tick all the boxes, but the features on offer still make it excellent value and its solid performance seals the deal.